Our well-trained pole barn builders provide personal service at your building site to ensure that every step of the construction process is smooth. 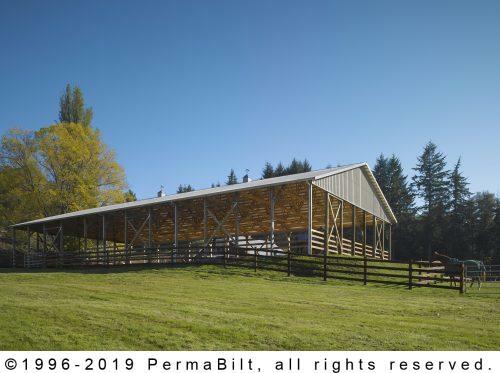 From siting and permitting through construction and cleanup, as well as financing and warranty, PermaBilt is an established local pole barn building company you can depend on to build your post frame structure right the first time, and build it to last. Our pole building types range from garages and shops to horse barns and arenas to all sizes of commercial buildings. They engineered to be energy-efficient and highly resistant to fire, earthquake, flood and wind forces. 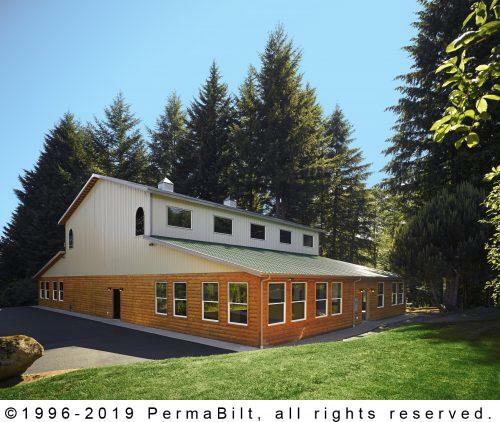 PermaBilt post frame buildings feature systems of widely-spaced, pressure-treated posts that are embedded in the ground and function as the foundation and structural frame. Each post frame structure is covered with 29 Gauge High-Tensile Steel Siding and Steel Roofing backed with a limited lifetime manufacturer’s warranty. 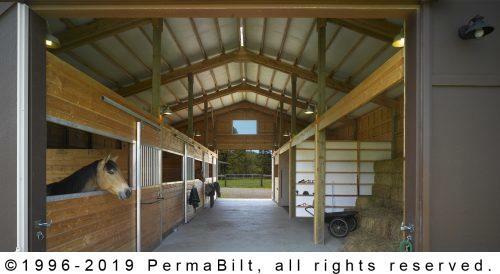 PermaBilt’s sophisticated “diaphragm” building design is a significant improvement over traditional pole building or stick-frame structures. It transfers the load through the roof, down the walls and into the ground. This makes PermaBilt structures stronger and able to withstand lifting winds, falling trees and other hazards better than a conventionally framed building. By allowing the roof to move as one piece, our diaphragm design helps PermaBilt buildings keep their lines through year after year of harsh weather conditions. 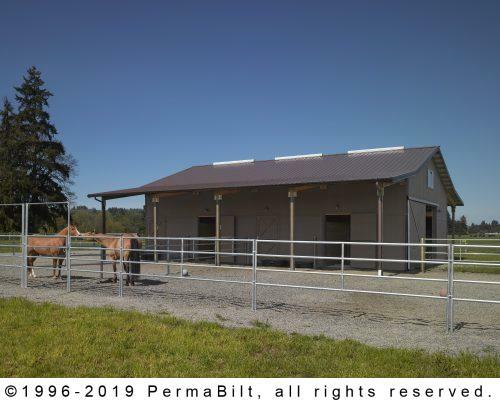 Although post frame pole buildings are used for just about every type of building these days, pole barns – horse barns are one of the most common applications of pole buildings today. 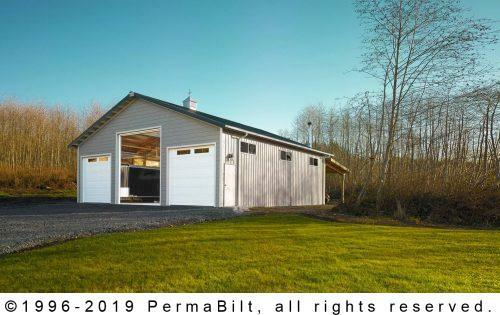 Large or small, simple or complex, PermaBilt post frame construction combines excellent design versatility with the latest in building engineering technology to create sophisticated, visually-appealing structures. Post frame is quickly becoming the construction method of choice for light industrial and commercial buildings. 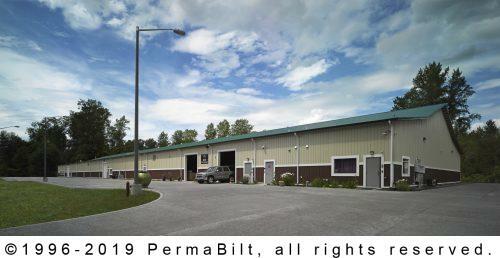 The broad range of building models, design features and safety benefits, coupled with low cost, make pole buildings a great option for storage, maintenance and active space that meets the needs of all kinds of commercial businesses, from utilities, manufacturers and school districts to administrative offices and yoga studios. Our professional commercial metal building representatives will walk you through the design phase to ensure the building you have dreamed about becomes a reality.